Andie is watching X-Files with glee while I do anything else on my phone. I watched it occasionally when it was on but never fell for the co-dependent characters. The return of this show was highly anticipated but from what I’ve seen, it is a love letter to past fans. It hasn’t changed my mind on it. Of course my mind wanders to Star Trek. CBS and Paramount are working very hard to move beyond the shadow of their fanbase — grown over the past fifty years. Some have argued that they have abandoned their nostalgia-bound fans in favour of the younger generation. They have given the 50 year old brand another jolt of coolness. For those of us who liked the older versions (and at this point even the franchises are the older versions) the reboots were a sense of betrayal that the philosophical, the morality play. The beloved Prime Directive, cornerstone of the Star Trek ethos, is non-existent in the movies and… wait. Let’s stop holding onto a fiction that wasn’t even consistently upheld within the fiction. Name a television Starfleet Captain who always stuck by the Prime Directive. Captain Nevergonnahappen from Makebelieve IV. Even if that one belief were maintained, the problematic narratives were not always favourable toward Starfleet. The reboots just highlights how gender imbalance/roles still exist in the future. I have treaded this path in other posts so my point is: nostalgia has blinded us to falsely favour the historic shows as something we should want in our future. Tribbles and holodecks aside, The society was not utopian. It is time to see what else the Star Trek universe has to offer. It is time to boldly unshackle our nostalgia and put our hope in the future of the franchise. With luck, Simon Pegg will stay at the writing helm as well as on screen as Scotty. They just named the CBS televised Star Trek co-creator and executive producer. Fans are chomping at the bit to regale the old tales via Bryan Fuller, who wrote and produced on DS9 and Voyager. 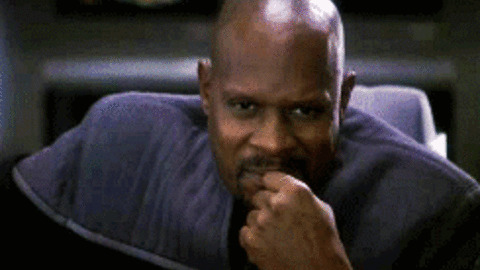 I liked the last shows with a female (VOY) and black (DS9) captain. Let’s hope Bryan Fuller gets his wish for diverse female fronted cast. But if we’re really reaching into the future, maybe he can also hire a diverse team of writers rather than just the old nostalgic white vantage point.